Handmade Ribbon is 3" wide x 39" long. 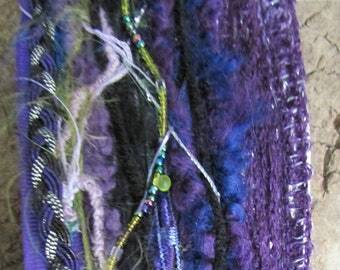 Beautifully handmade fiber art 3" ribbon with specialty yarns, ribbons, trims, beads and more! Colors range in dark stormy blues to navy along with a contrasting eye lash trim in lilac (My interpretation of a lighting bolt!). 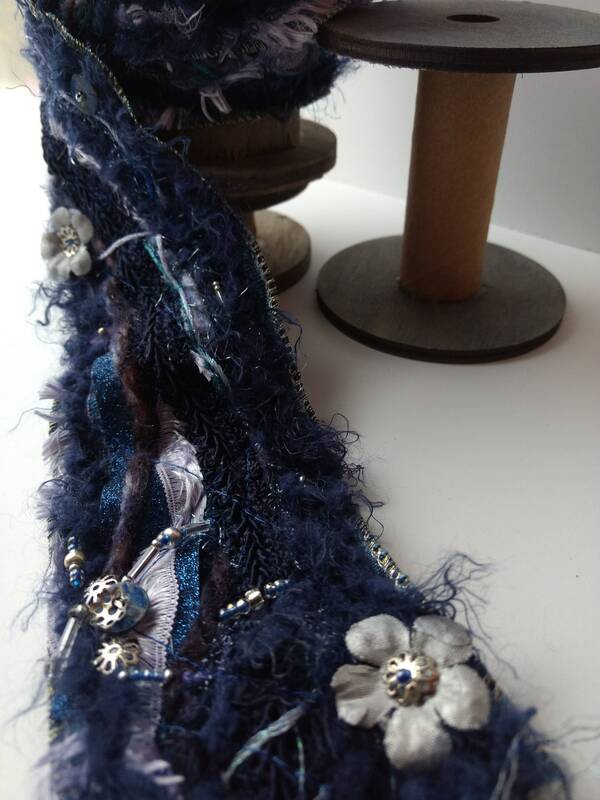 Silver beads and flowers intermittently hand sewn on the ribbon. 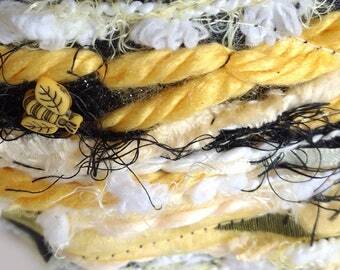 Fibers are frayed and 3 dimensional on this handmade ribbon. 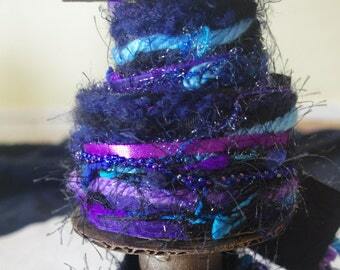 All fibers are sewn by machine onto a 3" wide blue ribbon and then hand sewn with beads and embellishment fibers. 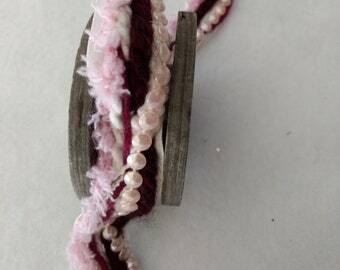 Our handmade ribbon can be used for all of your altered clothing designs, costume designs and journal embellishments for that added texture to your garment, accessory and journal making. If you are custom ordering a color or requiring more than one yard please contact owner first. NOTE: Spools are not included with sell. Spot clean with a damp cloth if ribbon gets stained. We want the buyer to be completely satisfied with each purchase. Color does not always show on the computer as it does in real life. We hope that you'll understand that there are so many variables that will affect what you see (including monitors, climate and individual perception) and that you understand that some differences can occur. No two yards are identical: if you need more than one yard for your project, just let me know and I will try to accommodate what you need. Note: Did you know with one yard of our handmade ribbon you can make 6 Jewelry Necklace Purses! Reserved Remake of my Boho Ribbon "Boho Mauvelous"
Fun ribbons for special projects! I look forward to future purchases with you! The best!